Paradise on Fort Myers Beach at Estero Beach & Tennis Club. Remodeled Condo available for you. Updated kitchen with granite countertops, dishwasher, stove, refridgerator (with ice maker), microwave. Updated bathroom with tile shower and sliding shower doors. New bedroom furniture. New sound proof tinted windows and sliding glass doors. Tile flooring throughout. WIFI available in building. Stereo with CD & IPod/MP3 player. 2-TV's -1 in living area and 1 in bedroom area. Very clean, beautiful, one bedroom/studio, non-smoking suite located in the Estero Beach and Tennis Club on the island of Fort Myers Beach. This deluxe condominium is situated directly beachfront with stunning views of the Gulf of Mexico, Estero Bay, Naples, and Sanibel Island. Our condo directly faces the Gulf of Mexico. Unit #804A is located on the 8th floor of building 'A' at Estero Beach and Tennis Club. Accomodates a maximum of 2 adults. Within walking distance of this condominium are excellent restaurants, shopping, drug store, liquor store, marina with boat rentals, 18-hole golf course, four theater cinema, and so much more. Catch the beach trolley to the north and south ends of the beach for only a quarter which stops right across the street for our condominium. Water sports... jet-ski, windsurfer rental, parasailing, etc. are just a short walk up the beach. This clean & attractive, gulf-front, eighth floor, corner suite on the Gulf of Mexico has a private balcony and spectacular views of the pool, beach, bay, and Sanibel Island. Stunning sunsets every night! Enjoy viewing Florida wildlife (pelicans, osprey, heron, egrets, dolphins, manatees, etc.) while watching the sunset from the balcony. Kitchen is fully-equipped along with microwave, stove, dishwasher and refrigerator. All the linens are provided. There is a dining area, living room, bedroom with king-size bed, and full private bathroom. Living room has queen-size hide-a-bed couch. Cable TV and stereo with CD player and IPod/MP3 player are included. There is a privacy door which slides shut to separate the living area from the bedroom area. Bathroom which has a full bath and shower is located off the bedroom area. Why pay for a hotel when you can enjoy paradise right here! Also available for your enjoyment and convenience are a large pool and deck, four clay tennis courts, barbecue grill, and on-site laundry facilities. Fort Myers Beach - your next vacation destination! We just spent a week in Ft Myers at this wonderful condo. The condo is exactly what it appears in the listing, which was great, because sometimes you never really know. The balcony overlooking the beach is fabulous. Very clean inside, nice new kitchen, plenty of towels and extras. This was a very relaxing vacation, walking on the beach, reading and taking in the sun. We saw so many shells on the beach, starfish and sand dollars, each day was something different. Very close walk to ice cream, dolphin tours and restaurants. Loved the location and it was easy to deal with the owners as we made contact on phone and email both in a very timely manner. We're so glad that you and your husband enjoyed your stay at our condo. We too find it a relaxing and very enjoyable place to spend some time at. A most relaxing week . My wife and I had a very relaxing stay with perfect weather and did not miss the Chicago cold. The condo unit is very modern with clean, new appliances, and kitchen cabinets. Everything was included except of course food. The view of the gulf is very relaxing. The building includes only one bedroom units and occupants are mainly seniors and thus all is very quiet. The pool is well maintained and there are restaurants within easy walking distance. A large grocery store requires a car or the fifty cent bus ride. We did miss having Wi-fi in the apartment although we knew it was not included; Wi-fi is available in the patio area as well as at several restaurants. One appliance that we would have appreciated is a DVD player as the video cassette player simply is out of date. We would consider returning as we did enjoy the carefree atmosphere. We spent a terrific week in this clean, efficient condo. The views of the Gulf from the 8th floor sliding doors and balcony are spectacular. We ate many meals in because no restaurant could match the view. We also found some good restaurants across the street...The Fish House and South Beach. In additon, we loved long walks on the ever changing beach. The bird watching is fantastic. We're glad you were able to enjoy yourselves. We too find the views and birdwatching spectacular. February 09 was our second stay at this condo. 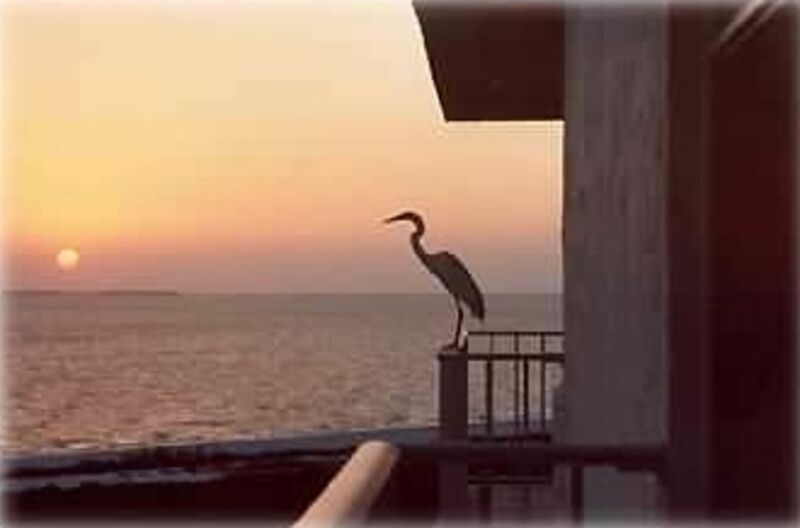 This condo has a excellent view of the Gulf and surrounding area. We enjoyed the birds (spoonbills, wood storks, egrets, heron, and many more) that frequented the wildlife refuge adjacent the property. Took long walks (3 to 4 miles) on the beach daily. An excellent place to relax and get away from the stresses of life! Rate does not include 11.5% tax (6.5% FDOR +5% Lee County) and does not include $105 cleaning fee. Saturday to Saturday arrival/departure only, please.